Every day has the postive intentions of Earth Day when you decide to create your art from recycled items. Our world is filled with old stuff just waiting to be transformed into something new. Plus there’s something extra creative about the challenge of taking old cardboard or tin cans and envisioning a whole new purpose for them. I’ve always made my garden art this way and it’s not just unique but very thrifty too. Here you’ll find six craft projects you can make with kids. All of them use old or recycled materials you may have at home or find at yard sales or thrift shops. They’re simple, fun, and can be made in an afternoon. 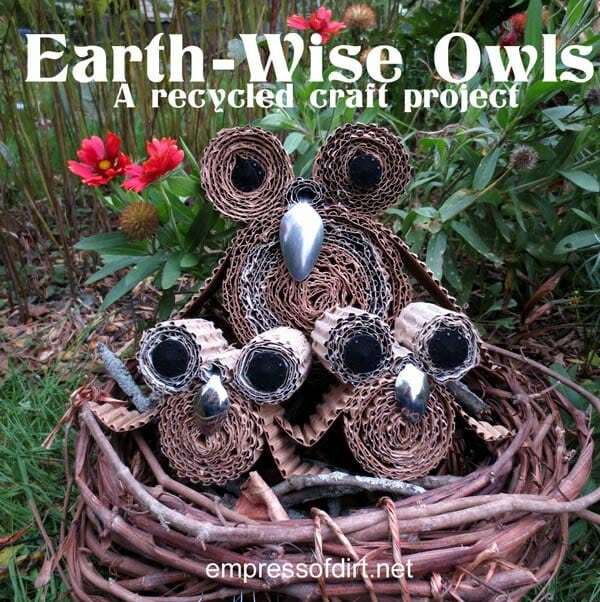 These Earth-Wise Owls are made entirely from recycled and repurposed items. To make it simple, I worked out all the calculations so you just need to get the cardboard prepared and you’re ready to go. 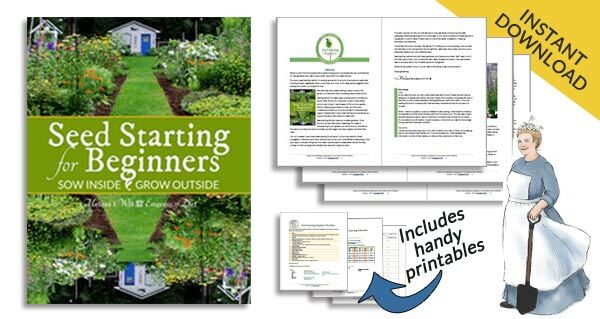 Get your free instructions here. 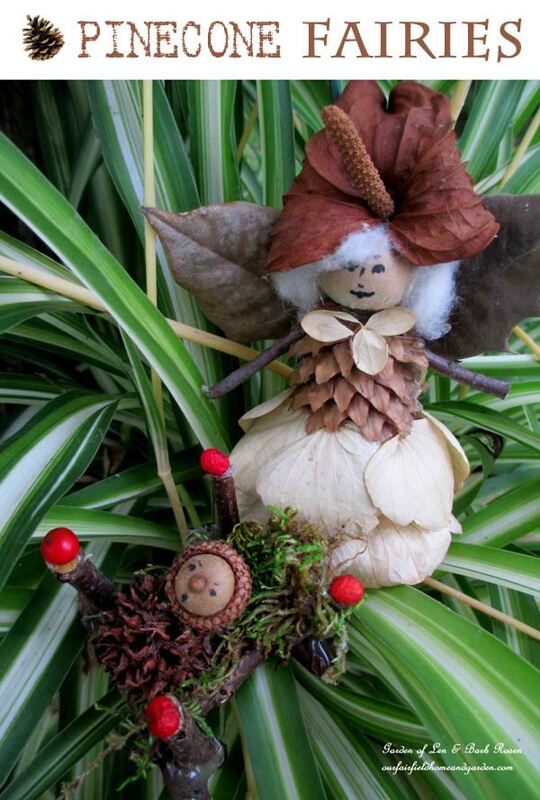 Barb Rosen of Our Fairfield Home & Garden created these wonderful pinecone fairies. 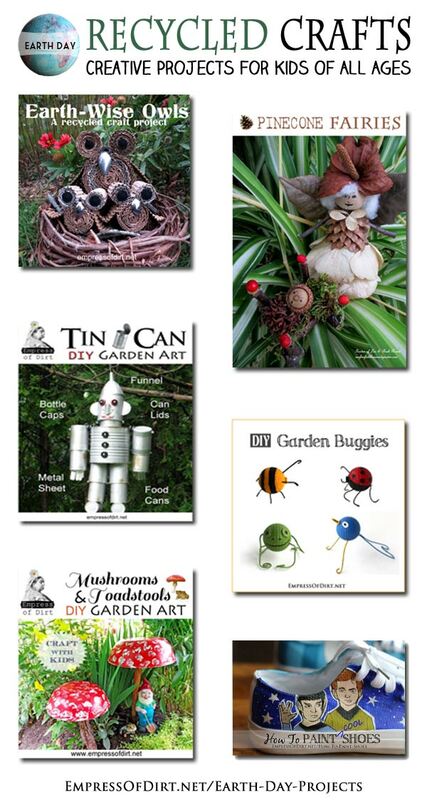 Go to her website to for a free tutorial and a bunch more ideas—each one is unique and some are very funny. 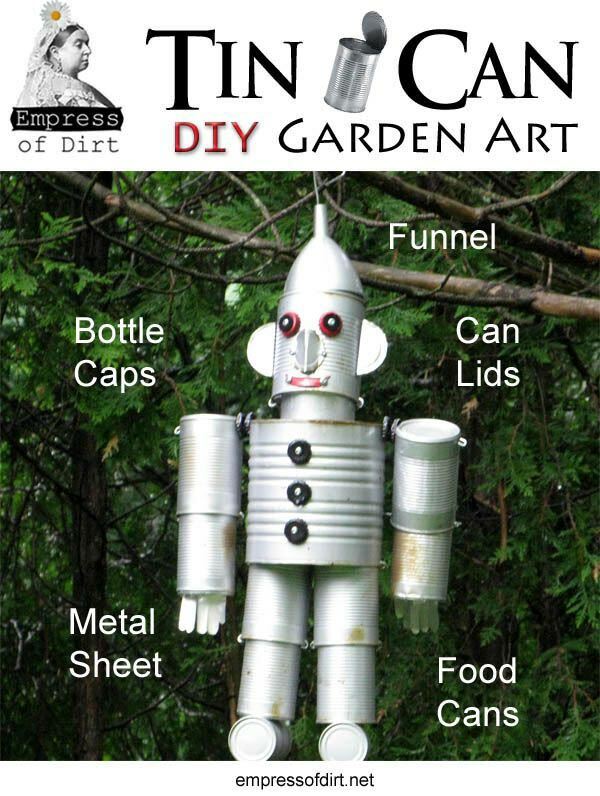 Get those tin cans out of the recycling bin and make yourself a garden art robot. And don’t forget to make him a tin can dog! Read more on how to make them here. Does your garden gnome need protection from the hot summer sun? 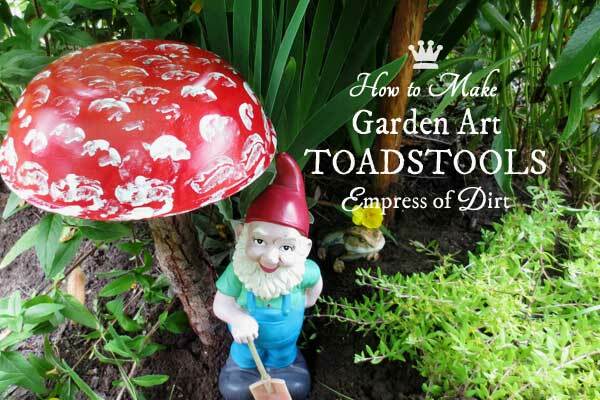 Make him a toadstool! This project is very simple. See the tutorial here. At last! The true purpose of golf balls! 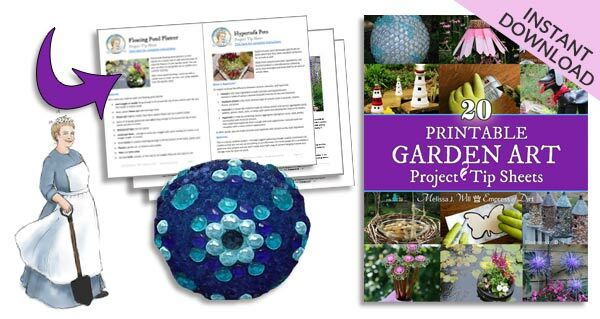 This golf ball craft has endless possibilities. 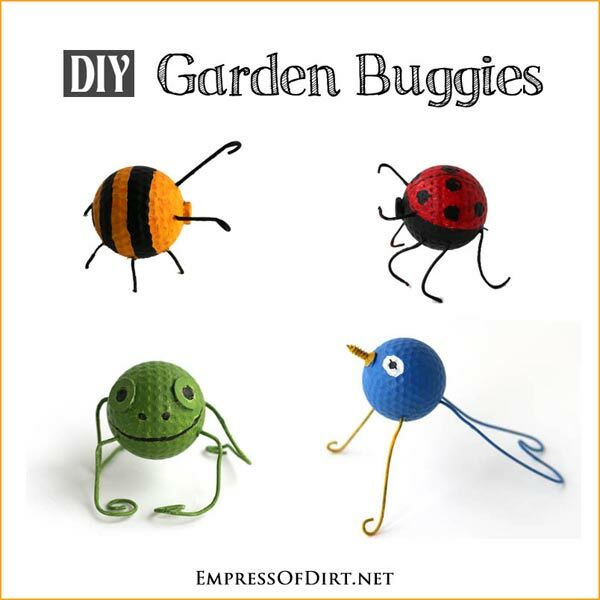 I made frogs, birds, ladybugs, and bees, but you could make anything you like. Free tutorial here. Shoes still fit but you find them too, meh, plain? 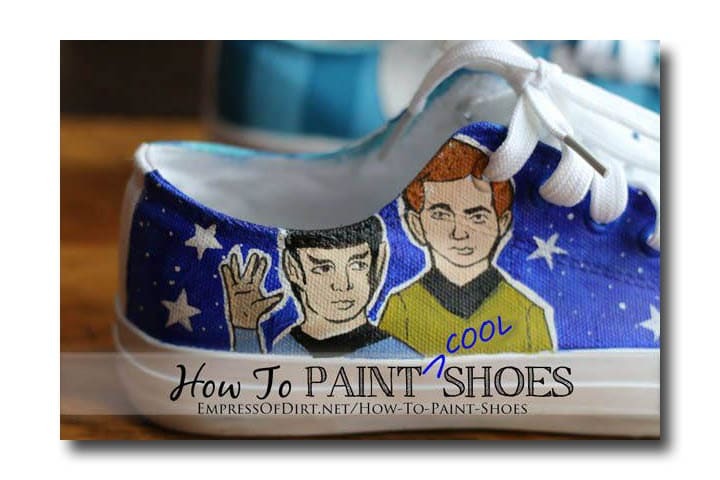 Paint them! My daughter experimented with a lot of different paints to find the perfect ones for this tutorial. Fun, whimsical and all very earth-friendly ~ all that is necessary for good old-fashioned fun!